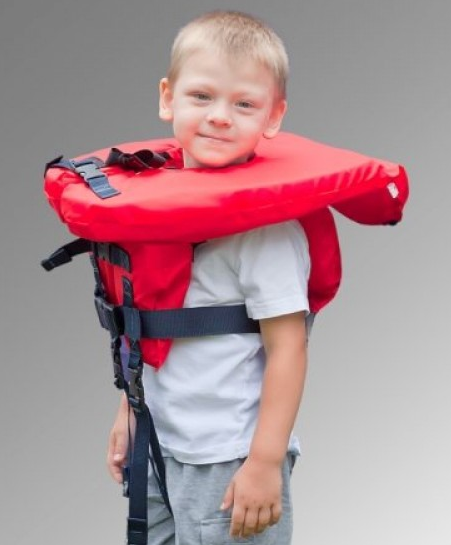 "Aquatic experts including the Red Cross have long agreed that a U.S. Coast Guard Approved personal flotation device (PFD) is the best option for keeping a child safe in, on and around the water. However, this is only half of the story. In reality, the key to safety for any child—abled or differently abled—wearing any type of flotation device is the supervision provided by the parent or caregiver when the child is in the water. Some facilities strictly enforce 'no use' of any flotation devices; the reasoning is that it gives the parents and possibly the child a false sense of security. As an aquatic supervisor of 30 years, I can tell you that this has some truth. We often see parents turning their attention away from children in a flotation device to visit or attend to another child. The guards have often had to go into the water to bring the child back to a vertical position, face out. That said, if there's a pool that won't allow a child to have the water assistance he or she needs, parents may need to fight to have it allowed." "A flotation device needs to provide support and safety, stabilize, facilitate movement, reduce fear and give the caregiver an additional 'hand' in supervising the child. The device should fit the needs of the child based on body type, strength, range of motion and style of movement/swimming. Too much flotation can impair mobility and reduce independence. That's why the choice of a device is as individual as the child with disability. His or her unique needs should be considered." "Work with an adapted aquatic instructor to find the safest, most comfortable personal flotation device that will allow your child to have the most fun in the water! Google 'aquatics therapy' or 'aquatics rehabilitation' or 'adaptive aquatics' to find a local one. Many OTs and PTs have experience in this area, so ask the ones at your child's school if they can assist. Rehabilitation hospitals with pools may also have a person who can help." Stearns Puddle Jumper Deluxe (for kids 30 to 50 pounds): "It has been a totally different pool experience since we bought one this summer," says Julie. "Our little man is able to move around the pool independently... with us nearby, of course. He cannot stand independently out of water, so it has been fun to watch him stand and walk with one." Ho Sports Life Vest (for kids 50 to 90 pounds): "I lucked out and got mine at Costco for a deal," says my friend Peggy, mom to an 11-year-old with Down syndrome. "It was a game-changer. He has complete freedom and can actually 'swim' with it. He can't go under—it completely pops up with him laughing and saying 'More!'" Life Jacket-Adapted (Lj-A) (comes in a variety of sizes, for 18 pounds and up): "This works perfectly for my Anna because she has no head control," says her mom, Paige. "It keeps her head above water, is very supportive with straps around both legs, waist and chest yet gives her some freedom even though I'm holding onto her by the loop in the back. If we didn't have the life jacket she would have to be held in the water, which isn't really age-appropriate for a 10-year-old nor very freeing, which is what being in the pool is all about for her." Neonoodle: "I've had a hard time finding CGA-approved pool tools that provide the right support for Zoe," says her mom, Suzanne, "so I was thrilled to find something affordable that worked and was easy to get. 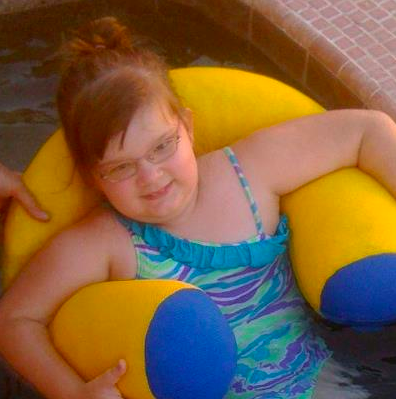 She can't swim or float independently, but she can hold onto this noodle with adults hands on safety assistance. Because it's neoprene and soft, it can be used for indoor therapy and support, too." Find 'em at Sam's Club, BJ's, Wal-mart and Academy stores. Danmar Products Delta Swim System #8720 available in small (30 to 60 pounds); medium (60 to 150 pounds); and large (150 to 240 pounds): Best for kids who are able to maintain balance. 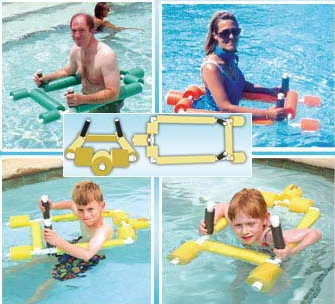 Danmar has a wide array of swim aids for kids and adults with disabilities. 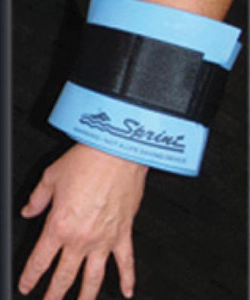 Sprint Aquatics Water Walking System available in sizes Xsmall to Large: "It is my favorite piece of equipment—I use it more than anything else, except noodles," says Lees. This site also has a wide array of swim gear, including an Aquatic Therapy section. 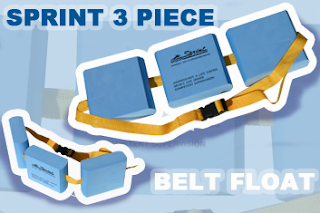 Sprint Aquatics 3-Piece Belt Float with an adjustable 50" belt: "The sectional floats can be positioned anywhere along the belt and therefore can be positioned in a variety of ways on the child," says Lees. Sprint Aquatics Buoyancy Wrap: "The Velcro means it can be positioned almost anywhere along the arms or lower legs for additional support without limiting movement," says Lees. There are some great ideas there, thankyou so much for sharing them. I cannot wait for summer! Coop loves the water and usually has a swing ring - or noodle which he loves but i like the idea of pushing him a bit and trying perhaps the vest with armbands or that walking device looks great! EXCELLENT post! We're big fans of the puddle jumper and that quote from Julie could've been a quote from me. This is such a great resource - thank you for compiling it!!! My husband's a former lifeguard and swim instructor. He is vehemently against "floaties" -- inflatable armband things -- because they ultimately make learning to swim harder. (I get an earful about this every time we go to the beach and he sees them.) Unlike vests, armbands that make your arms buoyant change your position in the water in ways that have nothing to do with the way the human body floats, which ultimately creates a safety risk; if your kid is used to how his or her body behaves while wearing floaties, he or she is at much more risk if he or she ever falls in while NOT wearing floaties. 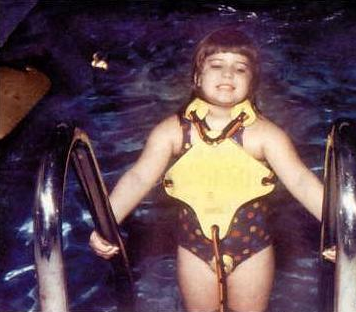 Whereas vest devices actually work with the human body's natural positioning in the water. Of course if floaties are a parent's only option for a kid with special needs, that would be different, but if there is ANY way a kid can use a vest or ring, my husband would argue (until your ears bled) that they're a much better choice. As a former special needs swim instructor and coach, I love your post! I agree with the post above but the other problem with the water wings is that they keep only arms afloat - so as an example, if a child wants to looks at their feet and puts their head underwater, they can get stuck - their arms are still floating above water but now they are floating upside down with their head stuck below water. I would highly encourage any other type of flotation device. have you heard of aquajoggers? they come in a variety of sizes. They are not specialfficlly designed for kids w/ special needs but work great for my students all who have mobilty but all cant swim. 4. It has to be ugly and scream therapeutic so it won't be banned. The “Sprint Aquatic Water Walking System” does the trick! My son is enjoying with it very much and I must say it is one worry free aquatic device. Thanks for posting! Have you looked into the Aqua Jogger? It is a one piece belt that goes around upper hips/waist with a "bump" rising in the middle that goes part way up the back or turned around to go on the tummy, depending on what position you want more buoyancy. It comes in children's sizes, but it does need to be tightened pretty good so it doesn't ride up over the rib cage too far. They will have to work a little harder to stay vertical. Does anyone know of any place where I could find different sizes of swim rings? My 8 yr-old daughter is only comfortable with this type of flotation device, but the regular ones in the stores have an inside diameter of only 8" (16-18" diam. ), which is getting tight. The next size is the adult ones that are too big and she can't fit her arms over. Does anyone know of a Puddle Jumper style device but for 55lbs+? My guy is only 3/12 and pretty skinny but heavy and tall. Love our puddle jumper but starting to exceed the weight on it. I'm looking for the same style for my daughter (puddle jumper 70lbs +). Have you had any luck finding something similar? I am looking too. I wish they made them for children a little over 50 lbs. I have an autistic son that does fine in a round float but he will get out of it and it scares me. He doesn't understand what drowning is or that he could die, so he will get ouit of it and go under intentionally and comes up happy. I have tried a lot of things and vests seem to cause him and my other kids to topple face forward and they struggle to get face out of water. They seem to not be able to stand up with them or topple face first or on back. So they seem scared to use any vests. I had vests that you buckle in front has float behind head and buckles between their legs. I have also had vests that were built into the suit as well. What do I do? Everyone says just get one approved by Red cross etc and I do but all my kids struggle with staying up right. They feel and look forced face down in pool and they can't swim, and if I try to help them swim, they are fearful they can't get up with these vests on. Having 3 yoiung kids and 2 older ones, it's very stressful and anxiety provoking for me in the pool. It's hard to keep all of them near me and hold them all. Which is what I have been doing every time for 3 yrs. Any help would be appreciated so much. Does anyone know where to find a vest that will not get caught in a slide? It can be a life vest, but not one that will get tangle up while going down the slide into the pool. I have used several different life jackets with my son who has CP with mixed tone, dystonia and quad involvement. 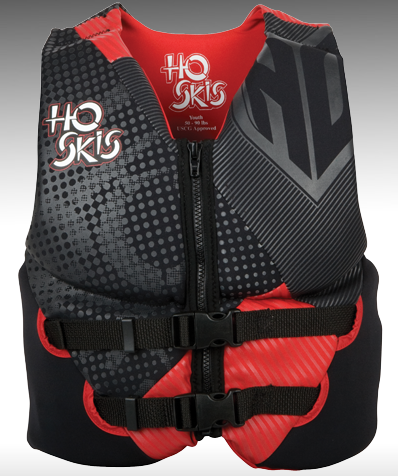 Of all the jackets we have tried the products from Life Jackets Adapted are a great fit for our needs. Our son swims weekly and requires arm's length adult presence but he gets to experience incredible freedom or movement in the water. I've bought several LJ-A and PFD-A models as my son has grown and even with weekly usage the jackets are durable enough to last until he outgrows them. They are not US Coast Guard Approved--I asked about this and the testing certification process is very costly for a small company. Nonetheless they work well and I would recommend them strongly.